I’m from Wales originally so celebrating Burns Night was not an important family tradition in the Griscti household. The thought of eating haggis never really appealed to me until I was at university and sharing a house with three Scots, so when planted with plateful, I naturally gave it a go. To my surprise I really loved it. It doesn’t look the most appetising of meals but on the first bite I found it to be flavoursome, light and totally moreish. A few years have passed by since my university days but I still love to celebrate Burns Night with a deliciously tasty haggis, accompanied by my own version of hearty neeps and tatties. We tucked into an M&S Haggis, made by Macsween of Edinburgh. It didn’t fail to impress. It was sweetly spiced, mouthwateringly tender and packed with flavour. I was particularly impressed that I managed to convert a non-Haggis eater into a haggis lover! “It is sooooo good,” was my friend Nikki’s verdict. I felt it important to include her exact review – thank you Nikki! We both came to the conclusion that if you’re squeamish about Haggis, one bite will completely change your perception. With its light consistency and spicy flavour it almost tastes like a rich type of stuffing, or lentil-based dish. I urge any non-Haggis eaters to give it a go. 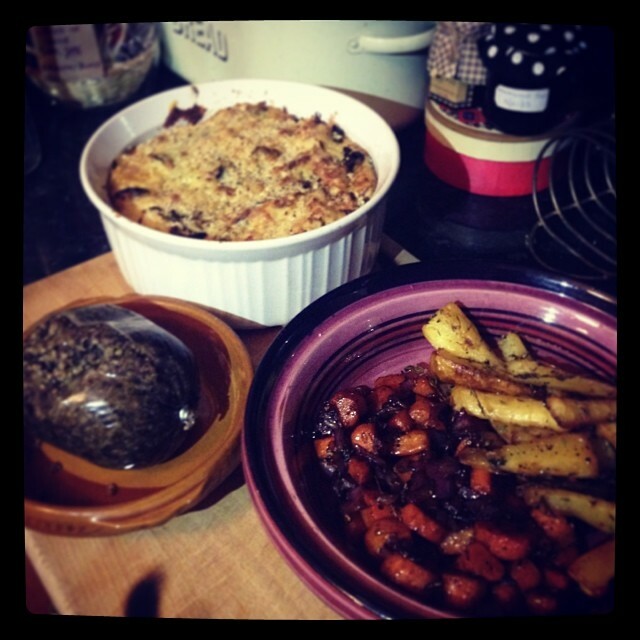 This is my own recipe and it works so well with Haggis. It’s a rich, creamy and textured mash with an indulgent crumbly cheese topping. 1) Steam some green cabbage leaves for about 10 minutes, keep the vegetable water as stock. 2) Make your mashed potato the usual way with plenty of butter, salt and pepper but instead of adding milk, add a touch of cabbage water (approx. 2 ladlesful – but judge for yourself: you don’t want the consistency to be too runny). Then add crème fraîche instead of milk. Again judge the amount by taste – you want it to be rich and creamy but not too heavy. 3) Stir the chopped, steamed cabbage leaves into the mash mix, adding a little more cabbage water / crème fraîche if needed. 4) Chop up approx. half a red onion and stir this into the mixture. Transfer into an ovenproof dish, then grate some Cheddar cheese and cover the top of the mash, together with a sprinkling of breadcrumbs and salt and pepper. 5) Cook in the oven for about 25 minutes, until the topping is golden brown. 1) Chop up and steam your carrots (enough for about four people) for about 10 minutes. Make sure they are not too soft, keeping a little crunch. 2) Chop up half a red onion and gently fry in some butter and a little olive oil until soft. Add a couple of spoonfuls of brown sugar then add the steamed carrots. Let the golden, sugary onions coat the carrots, then add a dash of balsamic vinegar (about 2 tablespoons). Gently cook for about 10 minutes, until the balsamic vinegar has reduced, adding salt and pepper to taste. Serve your haggis and tatties with honey-roasted parsnips with thyme (posh neeps), and a white wine, onion gravy. If you’d like some inspiration on foodie treats to stock up on for Burns Night, see my Scottish Food Buys on allabouty.com. Happy Burns night everyone!